Since Xander broke his arm last year, I have been much more cautious about the calcium intake for my kids. I don't know if he got enough calcium before the break, because he doesn't like milk, so getting his dairy is sometimes hard. One thing he loves though is the drinkable yogurt. I love that Stonyfield Farms products are all organic, and that the drinkable yogurt is a nice big size for a growing boy. 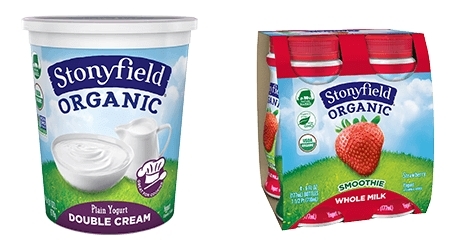 Following successful 2016 launches of Whole Milk Greek Yogurt and Whole Milk Grassfed Yogurt, Stonyfield, the country's leading organic yogurt maker, introduces new Whole Milk Drinkables and Double Cream Yogurt. The new products are the latest in Stonyfield's commitment to investing in its Whole Milk line. The company sees tremendous growth opportunity in this category as more and more Americans are embracing full-fat dairy. As with all Stonyfield products, the Whole Milk Drinkables and Double Cream Yogurt are made with USDA Organic milk without the use of toxic persistent pesticides, artificial hormones, antibiotics, and GMOs.